The work of two master artists is on view, with portraits by renowned American photographer Annie Leibovitz on the first floor and canvases by one of Japan’s most celebrated contemporary painters, Hiroshi Senju, on the ground floor. Both bodies of work revolve around the notion of power—Leibovitz explores it in the context of the human sphere with images of iconic public figures and Senju addresses it in the landscape with sublime waterfall images. Over a storied forty-year career, Annie Leibovitz has become best known for her portraits of public figures. This exhibition, comprising ten iconic prints in color and black and white, showcases a selection of her most enduring work. The subjects include Andy Warhol, Scarlett Johansson, Brad Pitt, Jack Nicholson, the Dalai Lama and Queen Elizabeth II. Annie Leibovitz began her career as a photojournalist for Rolling Stone magazine in 1970, while she was still a student at the San Francisco Art Institute. She joined the staff of Vanity Fair magazine in 1983. At Vanity Fair and later, Vogue, she developed a large body of work—portraits of actors, directors, writers, musicians, athletes, and political and corporate figures—that expanded her collective portrait of contemporary life. Leibovitz is the recipient of many honors, including the International Center of Photography’s Lifetime Achievement Award, The American Society of Magazine Editors’ first Creative Excellence Award and the Centenary Medal of the Royal Photographic Society in London. In 2006, she was decorated a Commandeur in the Ordre des Arts et des Lettres by the French government. Leibovitz has been designated a Living Legend by the U.S. Library of Congress. She lives in New York. 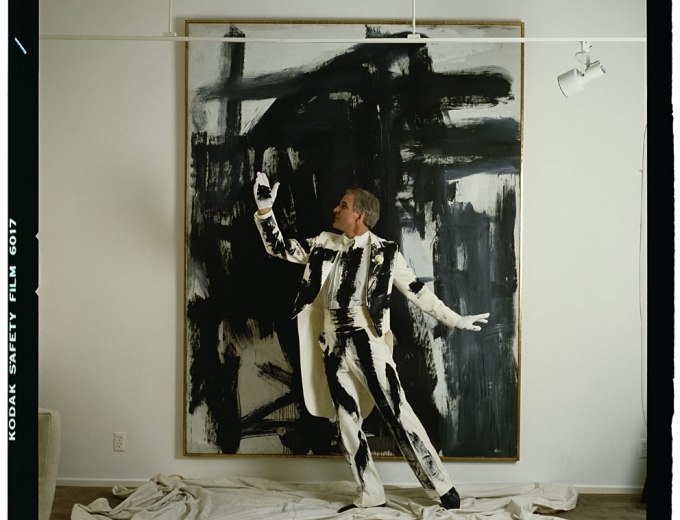 Exhibitions of Leibovitz’s work have been held at museums and galleries all over the world, including the National Portrait Gallery and the Corcoran Gallery of Art in Washington, D.C.; the International Center of Photography in New York; the Brooklyn Museum; the Stedelijk Museum in Amsterdam; the Maison Européenne de la Photographie in Paris; the National Portrait Gallery in London; the Hermitage Museum in Saint Petersburg and the Pushkin Museum of Fine Arts in Moscow. 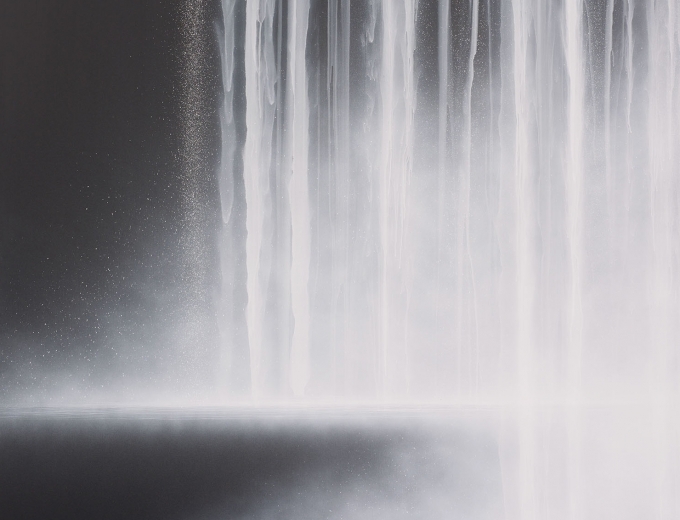 Hiroshi Senju is noted worldwide for his sublime waterfall and cliff images, often monumental in scale, which combine a minimalist visual language rooted in Abstract Expressionism with ancient painting techniques unique to Japan. Widely recognized as one of the few contemporary masters of the thousand-year-old Nihonga style of painting, Mr. Senju began exploring the waterfall image in the early 1990s. He uses traditional Japanese materials, such as pigments made from minerals, ground stone, shell, corals and animal-hide glue. With incredible delicacy, he pours translucent paint onto mulberry paper mounted on board, creating the sensation of unrestrained movement. Evoking a deep sense of calm, his waterfalls conjure the appearance, sound, smell and feel of rushing water. This intimate exhibition features six waterfall paintings, two of which are painted with fluorescent pigments. These images appear black and white in daylight but fluoresce an arresting electric blue under ultraviolet light. An ode to the ubiquitous city lights of contemporary existence, Senju’s waterfalls hover between day and night as he straddles the realms of industry and nature, the material and the ethereal. Hiroshi Senju was the first Asian artist to receive an Honorable Mention Award at the Venice Biennale (1995) and has participated in exhibitions around the world, including the Beauty Project at the Museum of Contemporary Art, London, in 1996; The New Way of Tea, curated by Alexandra Munroe, at the Japan Society and the Asia Society in New York in 2002; and Paintings on Fusuma, at the Tokyo National Museum in 2003. In 2003, Mr. Senju completed seventy-seven murals at Jukoin, a sub-temple of Daitokuji, a prominent Zen Buddhist temple in Japan. In 2004, he was the art director for the Haneda Airport International Passenger Terminal in Tokyo, where he completed one of his largest installations. The Benesse Art Site of Naoshima Island, designed by Tadao Ando, also houses two large-scale installations. 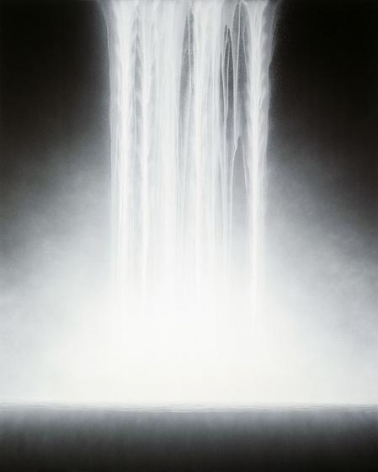 Hiroshi Senju’s work is in the Museum of Contemporary Art, Los Angeles; The Museum of Modern Art, Toyama, Japan; the Yamatane Museum of Art and Tokyo University of the Arts, Tokyo; and the Kushiro Art Museum, Hokkaido, Japan. The Hiroshi Senju Museum Karuizawa, designed by Ryue Nishizawa, opened in October 2011 in Japan. For more information about the exhibition, please email hongkong@sundaramtagore.com or call +852 2581 9678. Work by Hirosh Senju will also be on view at Sundaram Tagore Gallery’s booth at Art Central Hong Kong, March 13 to 16.